You may have readied a powerful SEO strategy for your website with strong keywords and content. In spite of these features, you may be noticing that there has not been any appreciable rise in your rankings. Of course, SEO efforts take time to bring you results. On the other hand, it is possible that something else is preventing your website from getting a rank. 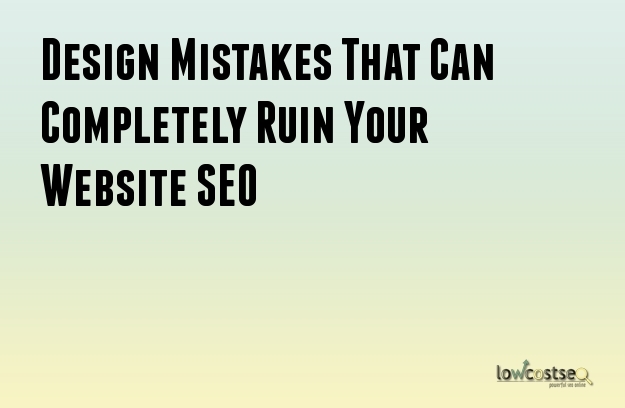 If that is the case, you should take a look at your website design as many people tend to overlook mistakes in this particular aspect of the website. There are many situations in which a web designer ends up using images that contain text instead of using live text. The problem with images containing text is that search engine crawlers are unable to read the text placed inside the images. As a result, they serve no SEO value whatsoever. Therefore, you should give preference to live text. If that is not possible, you should make sure that the images contain an ALT tag along with a description. Poor navigation is generally the result of placing more importance on the design than the user experience. If you really want to place elements to make the navigation interesting, you should first consider whether it is necessary for the users. You also need to determine if the users will prefer using the elements. You need to remember that the users will simply go back to the search results if they cannot navigate the site resulting in a high bounce rate. That is bad for SEO and user experience. User experience is one of the things that Google has been placing a lot of importance on. Therefore, the user experience provided by your website affects your SEO greatly. If users are not happy, Google will not give you a good ranking. One of the worst ways to reduce user experience is through the addition of popups. Avoid them if possible. If you do use them, you need to make sure that they have been used properly. For example, ensure that they do not appear more than once during any given session. Images can certainly form a vital part of your website. In fact, users these days demand images in any website they are visiting. Google understands this which is why even images can play a role in SEO and the subsequent rankings. As a result, you need to use these images in the best manner possible. That means you have to optimize them for your website. Optimization of images can decrease page loading times and improve user experience. Addition of ALT tags and descriptions are also a part of image optimization. Google believes in giving its users the best results. This includes websites that can display correctly in the device of the user. Responsive design simplifies the process by ensuring that the design is automatically modified to suit the device and screen size. Absence of a responsive design will reduce your rank and the number of users visiting through mobile devices.